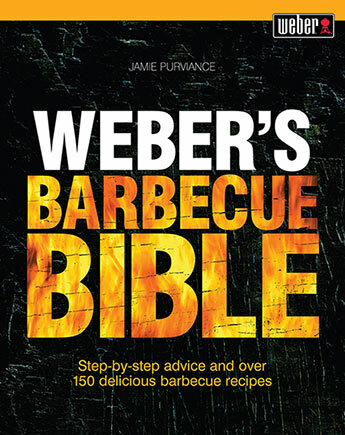 The step-by-step guide to expert barbecuing. 1. Combine the stuffing ingredients in a bowl. The stuffing should be moist, mounding nicely on a spoon, but should not be sopping wet. Add more stock if needed. 2. Carefully place a large disposable foil tin underneath the cooking grill to catch the bacon grease. Prepare the barbecue for indirect cooking over a high heat. 3. Place the butterflied turkey breast on a work surface between 2 sheets of plastic wrap and pound to an even thickness. Spread the stuffing evenly over the turkey breast and then roll up the breast lengthways to create a cylinder. Arrange the bacon slices on a work surface in 6 tightly spaced, parallel rows, overlapping the ends of 2 slices to make each row. Place the rolled turkey breast in the centre of the bacon and then criss-cross the bacon around the turkey. Tie the turkey with butcher's string to create a uniform roast and to secure the bacon. 4. Brush the cooking grills clean. Centre the turkey over the drip tin and barbecue over indirect high heat for 1 to 1¼ hours, with the lid closed as much as possible but turning occasionally to ensure the bacon gets crisp on all sides, until the internal temperature reaches 77ºC (170ºF). Transfer to a carving board and allow to rest for 10 minutes (the internal temperature will rise during this time). Remove the string and carve into 2.5-cm (1-inch) slices. 1. Whisk the marinade ingredients together in a small bowl. 2. Arrange the chops on a large, rimmed plate. Spoon or brush the marinade over the chops, turning to coat them evenly. Cover with plastic wrap and refrigerate for 1 to 2 hours. 3. Remove the cutlets from the refrigerator 20 to 30 minutes before barbecuing. Prepare the barbecue for direct cooking over a high heat. 4. Brush the cooking grills clean. Barbecue the cutlets over direct high heat, with the lid closed as much as possible but turning once, until nicely marked on both sides and cooked to your desired doneness, 4 to 6 minutes for medium rare. 5. Remove the chops from the barbecue and allow them to rest for 3 to 5 minutes. Serve warm with lime wedges, if desired, for squeezing over. 1. Fill a large saucepan with water to within a few centimetres (inches) of the top. Add 2 teaspoons of the salt to the water and bring to the boil over a high heat. Add the carrots to the boiling water and cook for 4 to 6 minutes until tender but still crisp. Remove the carrots from the saucepan and plunge into a bowl of iced water to cool them rapidly, then remove them from the water and drain. 2. Prepare the barbecue for direct cooking over a medium heat. 3. Combine the melted butter, honey, orange rind, vinegar and the remaining ¼ teaspoon of salt in a large bowl. Add the carrots to the bowl and toss to coat them evenly. 4. Brush the cooking grills clean. Remove the carrots from the bowl and let the excess butter mixture drip back into the bowl. Set the bowl aside. Barbecue the carrots over direct medium heat for 4 to 6 minutes, with the lid closed as much as possible but turning occasionally, until lightly caramelised. Place the carrots back into the bowl with the remaining butter mixture. Toss to coat thoroughly. Sprinkle with the parsley and serve warm with orange wedges for squeezing over, if desired. 1. Combine the marinade ingredients in a blender or food processor and process for about 1 minute to purée. Set aside 250 ml (8 fl oz/1 cup) of the marinade to use as a basting sauce. 2. Remove the thin membrane from the back of each rack of ribs (see page 121). Season the ribs on the meaty sides with salt. Brush the remaining marinade over all the ribs. Allow the ribs to stand at room temperature for 30 minutes before cooking. Prepare the barbecue for indirect cooking over a low heat. 3. Brush the cooking grills clean. Stack the ribs on top of each other, with the bone sides facing down, and barbecue over indirect low heat for 45 minutes, with the lid closed. 4. Undo the stack of ribs on the barbecue. Brush the meaty sides with some of the reserved marinade. Stack the ribs, with the bone sides facing down, moving the top rack to the bottom, the bottom rack to the centre, and the middle rack to the top. Cook over indirect low heat for another 45 minutes, with the lid closed. 5. Undo the stack of ribs on the barbecue again. Brush the meaty sides with some of the reserved marinade. Stack the ribs, with the bone sides facing down, moving the top rack to the bottom, the bottom rack to the centre, and the middle rack to the top. Cook over indirect low heat for 1 to 1½ hours, with the lid closed. During this third round of cooking, move the relative positions of the ribs occasionally so that the racks that are browning a little faster cook in the centre of the stack and the racks that are not as brown cook at the top of the stack. As you move the ribs, brush the meaty sides with the reserved marinade. 6. Undo the stack of ribs and place them side by side, with the bone sides facing down, over direct low heat for 10 to 15 minutes, turning occasionally to prevent burning. Brush with a little more of the reserved marinade and continue cooking until the meat is very tender and has shrunk back from the ends of the bones. 7. Transfer the racks to a roasting tray, cover with foil and allow to rest for 15 minutes before cutting into individual ribs. Serve warm.